This incredibly healthy breakfast is surprisingly easy to pull together. And seriously tasty, too. I make this breakfast when I feel lazy and don't have much fresh food in the fridge. Why? 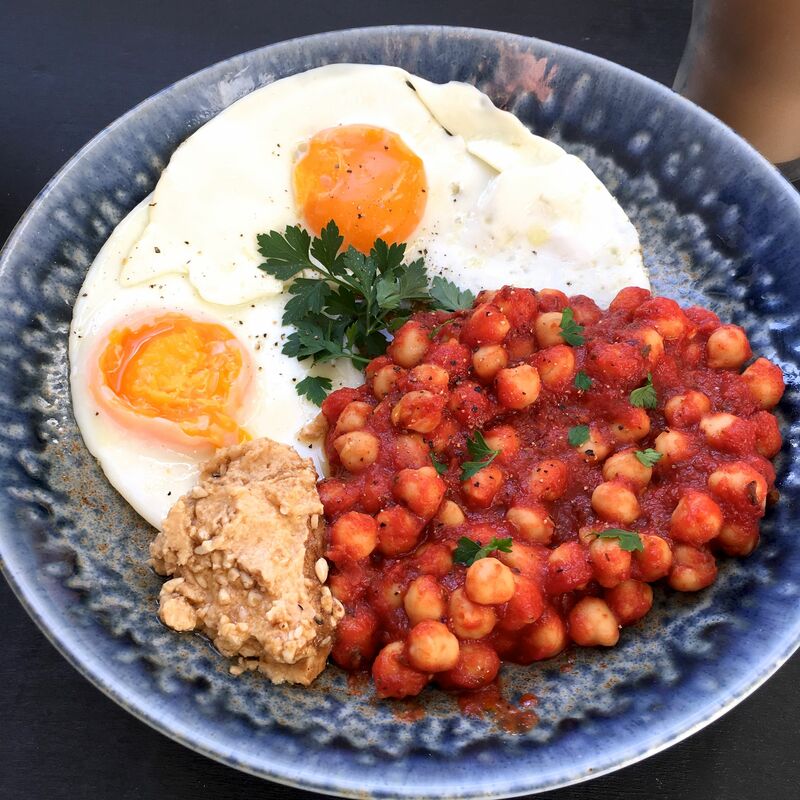 Chickpeas are a super convenient slow-burning and fibre rich type of carb, which is great for your gut healthy (hello, regular bowel motions)! This breakfast serves up an impressive 5g of fibre, helping you nail your recommended 20-25g of fibre per day. This healthy breakfast idea is loaded with protein! One serve of this breakfast will give you an impressive 19.5g of protein! For protein, you might need around 50-70g per day (depending on your gender/weight) so that's a killer start. You'll start your day with a serve (or two) of veg! My number one health goal is to eat loads of vegetables. When you eat this breakfast, by the time you leave for work, you'll already have 1-2 serves done and dusted. That helps when you're like me, and aiming for 5-10 serves a day! Plus, you'll also be getting wonderful healthy fats (thanks to the egg yolks and extra virgin olive oil) to keep you feeling satisfied after eating and help your hormones say balanced and fire on - as they're meant to. This breakfast idea is awesomely healthy for just about everyone. BUT It's especially good if you're looking after your heart health, have diabetes or want to prevent diabetes, get constipated, vegetarian, want a high protein breakfast, want to eat healthy on a budget, keen to balance your mood and hormones or want to start your day with long-lasting energy to feel great. If you have leafy greens, it's easy to add a handful to each plate. I simply didn't have any handy when I made this breakfast. I had hummus in the fridge so added some but a quarter of an avocado, feta cheese or some fermented veg would also be awesome. Use whatever herbs you have handy, about 1 tablespoon in total. I love chilli flakes for a slight warmth. Add 1 clove of garlic if that's your jam. It would look pretty if you serve the eggs on top of the chickpeas/tomatoes too! You can also use passata instead of tinned tomatoes. Just use half the jar. You can also cook the eggs IN the chickpea/tomato mix (like shakshuka). Make wells in the mix, then crack in your eggs. Wait till cook then enjoy! 1. Eat a large and a small fry pan on the stove top to med-high. Split oil between the two pans. 2. Once hot, add chickpeas to large pan. Meanwhile, crack eggs into the small pan. 3. Return to the large pan and add tomatoes and herbs to chickpeas. Sautee for 3 minutes until heated through.4. Serve with leafy greens (if you have) and/or a dollop of hummus or fermented veg (optional). Add salt and pepper to taste and enjoy. More healthy recipes you might love! Want some healthy ideas and inspo? Read the blog!